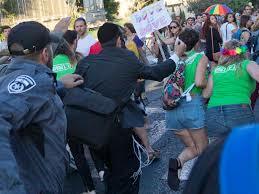 four weeks ago the annual parade of the homosexual community took place in Jerusalem. The police dedicated a lot of manpower to make sure no violence would take place. But, in spite of all the security measures an ultra-orthodox male attacked as many people he could. A sixteen years old girl was murdered and five wounded. When that person was taken into custody – it was revealed that ten years ago he attacked the same parade and wounded several people, a crime for which he was sentenced to ten years in prison. He was released just two weeks prior to the incident. This murder should not have happened. There was prior knowledge, even expectations, that such a person might do it again. The automatic reaction to the incident was carrying an inquiry to find those who were responsible for the terrible event. The existing common culture in Israeli politics is demanding the layoff of the responsible parties who have failed to do their job. The tragic consequences made the failing much more severe. This means, failing to do your job is bad enough, causing tragic consequences, even though you did not have any influence on the consequences, is TERRIBLE and you have to pay the price. Let me stress the last point as it is part of the general ignorance to deal with uncertainty. If the attacker would have been stopped before wounding anyone – no inquiry and no public punishments would have occurred. So, the paradigm is that when you make a mistake you are responsible for the consequences of the mistake. This is true even though the actual consequences depend solely on luck (or God). Part of the cultural problem is the participation of the media in the vocal public demand to remove senior figures from their job in order to feel that “justice has been done”. The smell of blood is of great value to the media. Does the automatic reaction reduce the probability for future mistakes??? We often don’t really understand the core cause of problem that caused the undesired effect. An inquiry that aims to find guilt, rather than solution, frightens people causing them to conceal facts that might point to them! Even when the full facts are revealed – the real issue of “how come good and experienced people have made the mistakes that caused the chain of effects” is not fully recognized. The real lessons are not learned and digested and thus no real change takes place. Sometimes people who made a mistake intuitively understand what went wrong and why. Now, if you replace those people with people who did not experience such a mistake – what is the chance that they would not repeat a similar mistake??? I have developed, together with Dr. Avner Passal, who is an organizational behavior consultant, a methodology for Learning from ONE Event (called also learning from Experience). There is a past webinar on the TOCICO site and everyone who just likes to get the slides could write to elischragenheim@gmail.com). However, the necessary condition for truly learning the RIGHT LESSONS from an unfortunate event is not to prosecute people for their mistakes, but demanding that mistakes should not be repeated! They showed clear and significant negligence! They made a clear unprofessional mistake! For this to apply you have to be quite certain that any other qualified person would NOT have done that mistake. There was intent to cause damage! I believe this is a very rare incident, and when it happens I’d initiate an inquiry to understand and learn the lessons how come somebody wanted to cause such damage. When the right culture is in place, recognizing that we all make mistakes and when we do such a mistake we are required to learn the right lessons for the future. Implementing the structured methodology would generate real value. The ability to analyze an unfortunate event (it can also deal with unexpected fortunate events), diagnosing the core flawed paradigm and carefully develop the ramifications, should be viewed as an integral part of TOC Culture leading to ever-flourishing organizations. I so much agree with your commentary above. It is so easy – and lazy to point fingers and bay for blood. Your three categories are a must together with the prerequisite culture. Can I share a true story – the origin I long ago forgot. A very high ranking USA airforce captain had to eject from an out of control jet fighter shortly after take-off at an American Air base. The plane crashed and was destroyed. The cause of the crash was attributed to an omission by a technician who worked on the plane in the maintenance depot. The captain asked to see the now suspended technician personally. The technician as you can imagine was mortified by the prospect of meeting the man he nearly killled. The captain looked the technician in the eye and said to him… I want you back on the job and for you to let me know when you are done with fixing this jet – I want to fly it. Thank you Andrew, great story. Great post. I´d like to check and perhaps challenge the last bit: wouldn’t take action against a person (even when justified) hinder or even stop the learning process? Many times criteria involve subjective criteria, but even on the cases where it doesn’t, if someone is actually penalized will this have more impact in the future or less than chasing down the core cause of the problem? In other words what is more efective: fear of penalties or the blockage of problems sources? One personal experience that marked me deeply was the passing of my mother. Afer having a second occurrence of pancreatitis she stayed in intensive care for months and eventually died. We received afterwards a couple of volumes of exams, tests, procedure documentations etc. What was not done was an autopsy nor any other kind of postmortem examination to try to prevent similar fatalities (I was told that this kind of recurrence can lead to 90%+ death ratio). I concluded later on that the prevailing guilt culture does not allow healthcare people to effective learn and implement a process of ongoing improvement. Was there any possibility of blaming someone in this? Probably, but the fear of even an accusation was more damaging to a learning than anything else. Hi Humberto, I try to find the possible difference in our views, but I can’t. You start with the question whether penelyzing a person would not stop any learning? Yes, it could easily do it, unless it is obvious that it does not make sense not to. When someone in an organization truly show neglegence it makes others uncomfortable to the very least. When such a clear neglegence causes considerable damage, then I think most employees would expect a penalty and think of it as justified. In one of my previous posts I spoke of the fear for unjust criticism that causes huge negative ramifications. The emphasis is on “unjust”, because being unjust and/or unfair makes everybody to be over defensive. When most employees feel that the cricism is not “unjust”, which does not always mean they fully agree with it, and when it is viewed as generally “fair” then it does not cause that negative fear. Healthcare is one of those areas where the fear of penalties clearly prevents any learning. Several years ago the hospitals in Israel asked the Ministry of Health to be able to conduct “learning inquiries”, which would be kept secret unless a clear authorisation by a judge will make the protocol visible. I understand that plea as a wish to do real learning in order to avoid future mistakes, but still be reasonable protected from the consequences of penalties for any mistake. The media attacked that plea, blaming the hospitals for trying to “bury their mistakes”. I’m afraid it is us who are going to be buries, because of the fear to learn from the mistakes in healthcare.